This one day workshop /conference aimed to bring together academic faculty and students with activists in order to discuss and exchange knowledge about the relationship between poverty struggles and the realities of food provisioning, housing, caring and clean environments. The workshop was over-subscribed, with 104 people attending. 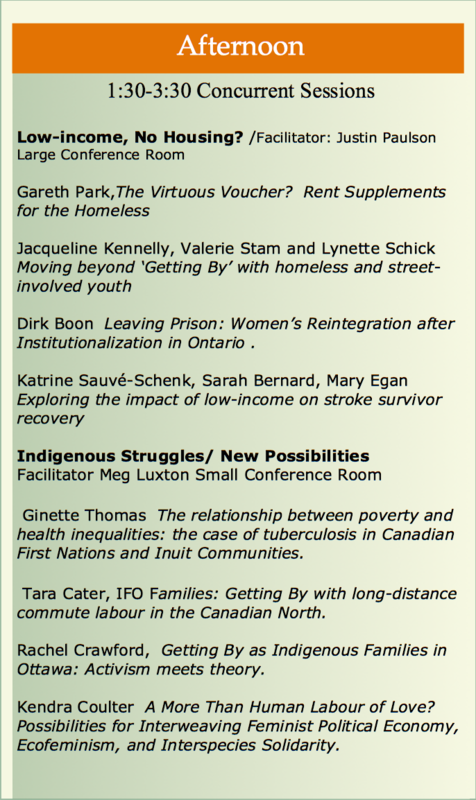 Papers from the conference presentations have been submitted for publication to a wide range of publications, including Labour/Le Travail, the Canadian Journal of Sociology, and Canadian Public Policy. The organizers have been informed of 5 paper submissions. Several of the participants have continued to connect through activist/academic working groups. 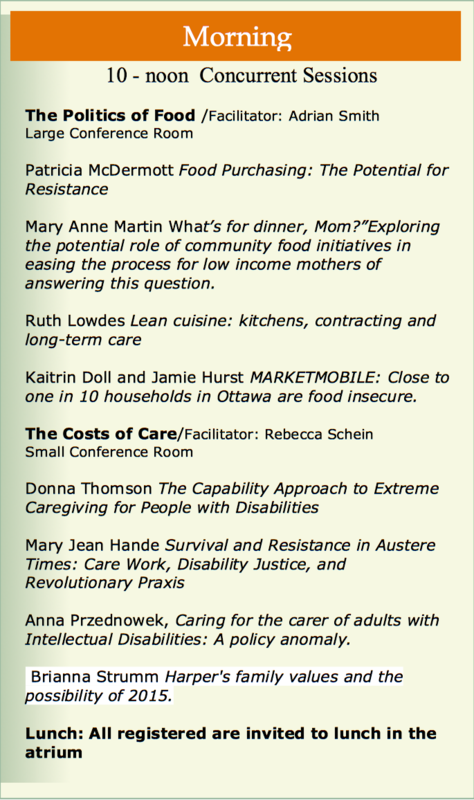 Two of these groups were featured at Congress – one in sociology (feminist political economy) and one in work and labour studies ( care work). These groups have connected graduate students at Carleton to broader networks from across Ontario. There is a third group on youth activism. The main outcome for the conference was to bring together those with common interests to consider and address poverty not just as a condition of insufficient monetary income, but as a condition of everyday life that imperils nutrition, safe and sufficient housing, care arrangements and a safe and relatively non-toxic environment. The hope was to create relationships among those attending. To date, the working groups are one indication of some success. There is also at least one research grant application in process among the working groups. 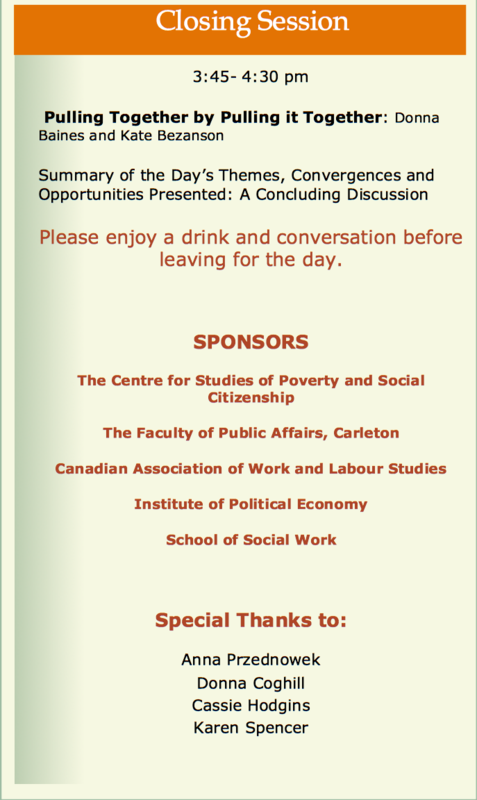 The organizers have received – and have accepted – 4 opportunities to present public talks on poverty as a result of the workshop. 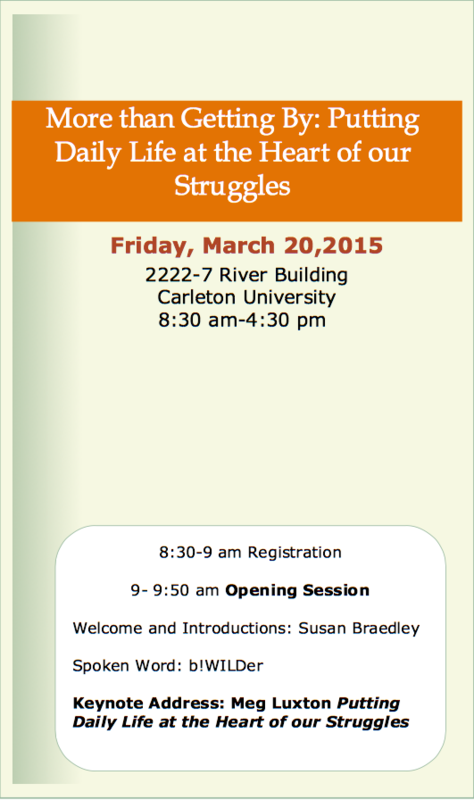 A book project – aimed to develop a primer in Feminist Political Economy – developed as a result of this workshop.